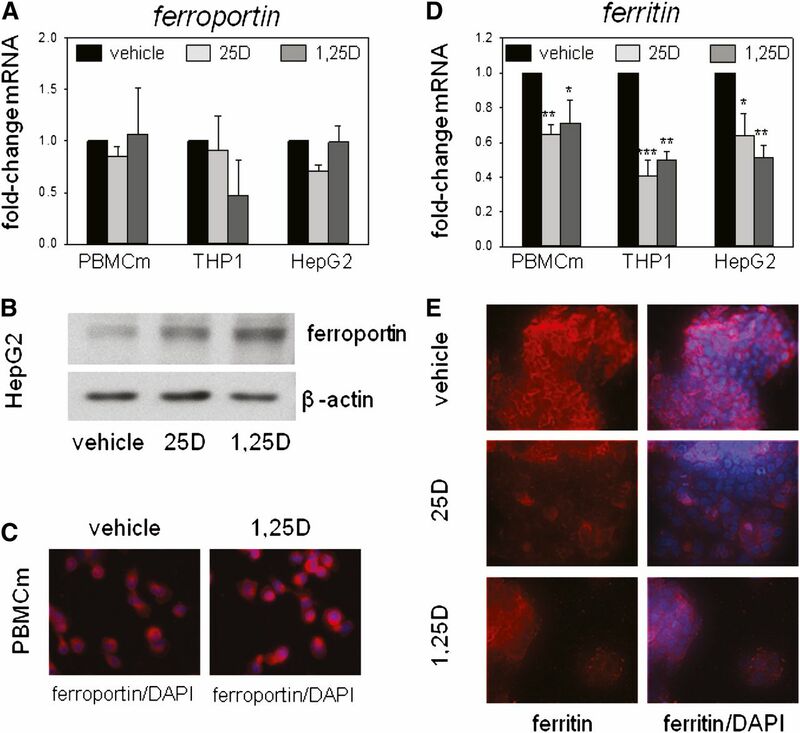 The antibacterial protein hepcidin regulates the absorption, tissue distribution, and extracellular concentration of iron by suppressing ferroportin-mediated export of cellular iron. In CKD, elevated hepcidin and vitamin D deficiency are associated with anemia. Therefore, we explored a possible role for vitamin D in iron homeostasis. Treatment of cultured hepatocytes or monocytes with prohormone 25-hydroxyvitamin D or active 1,25-dihydroxyvitamin D decreased expression of hepcidin mRNA by 0.5-fold, contrasting the stimulatory effect of 25-hydroxyvitamin D or 1,25-dihydroxyvitamin D on related antibacterial proteins such as cathelicidin. Promoter-reporter and chromatin immunoprecipitation analyses indicated that direct transcriptional suppression of hepcidin gene (HAMP) expression mediated by 1,25-dihydroxyvitamin D binding to the vitamin D receptor caused the decrease in hepcidin mRNA levels. Suppression of HAMP expression was associated with a concomitant increase in expression of the cellular target for hepcidin, ferroportin protein, and decreased expression of the intracellular iron marker ferritin. In a pilot study with healthy volunteers, supplementation with a single oral dose of vitamin D (100,000 IU vitamin D2) increased serum levels of 25D-hydroxyvitamin D from 27±2 ng/ml before supplementation to 44±3 ng/ml after supplementation (P<0.001). This response was associated with a 34% decrease in circulating levels of hepcidin within 24 hours of vitamin D supplementation (P<0.05). These data show that vitamin D is a potent regulator of the hepcidin-ferroportin axis in humans and highlight a potential new strategy for the management of anemia in patients with low vitamin D and/or CKD. Studies of patients with CKD suggest that vitamin D status (serum concentrations of the prohormone 25-hydroxyvitamin D [25D]) correlates inversely with the prevalence of anemia7 and ESA resistance8 and directly with blood hemoglobin levels.8 In hemodialysis patients with anemia, vitamin D repletion has been shown to correlate with lower ESA requirements.9,10 Vitamin D is known to exert physiologic activities beyond its classic skeletal function, notably as a potent inducer of antimicrobial proteins such as cathelicidin antibacterial protein (encoded by the cathelicidin [CAMP] gene).11,12 In this respect, it is interesting that hepcidin was initially described as an antimicrobial peptide (encoded by the gene for hepcidin antibacterial protein, HAMP),13 with its role in iron homeostasis being a later observation. We therefore hypothesized that vitamin D can act to regulate expression of hepcidin, in a similar fashion to its effects on other antimicrobial proteins. To test this hypothesis, vitamin D–mediated changes in hepcidin and cathelicidin were compared using in vitro and in vivo models. Studies in vitro using PBMC monocytes, THP1 cells, and HepG2 cells showed that treatment with 25D (100 nM) or 1,25-dihydroxyvitamin D (1,25D) (5 nM) for 6 hours decreased expression of mRNA for HAMP (Figure 1A). In PBMC monocytes and THP1 cells, this response contrasted the effect of 25D and 1,25D in stimulating expression of mRNA for antibacterial CAMP (Figure 1B) and the vitamin D catabolic enzyme CYP24A1 (Figure 1C). In HepG2 cells, treatment with 25D or 1,25D appeared to have no effect on expression of CAMP, and 1,25D induced only a small increase in mRNA for CYP24A1. Additional experiments with PBMC monocytes showed that suppression of mRNA for HAMP was also observed after 24-hour treatments with 100 nM 25D (0.57-fold±0.21, n=3; P<0.05) or 1,25D (0.27-fold±0.36, n=3; P<0.01). Vitamin D suppresses expression of hepcidin (HAMP) in human monocytes and hepatocytes. Effect of in vitro treatment of PBMC monocytes (PBMCm), monocytic THP1 cells, and HepG2 hepatocytic cells with vehicle, 25D (100 nM), or 1,25D (5 nM) for 6 hours on expression of mRNA for HAMP (A), CAMP (B), and CYP24A1 (C). Data are shown as mean fold-change in gene expression (±SD) relative to vehicle (0.1% ethanol) controls. *P<0.05; **P<0.01; ***P<0.001, statistically different from vehicle-treated cells. For RT-PCR data, n=8 separate donors for PBMC monocytes, n=4 separate cultures of THP1 cells, and n=5 separate cultures of HepG2 cells. To determine whether vitamin D–mediated suppression of hepcidin also occurs in nonhuman models, further studies were carried out in vitro using mouse monocytes. Peripheral blood-derived monocytes from wild-type C57BL/6 mice showed no change in mouse hepcidin (Hamp) gene expression after 24-hour treatment with increasing doses of 1,25D (Supplemental Figure 1A). Similar results were also observed for the mouse monocyte cell line J774 after 6-hour treatment with 25D (100 nM) or 1,25D (10 nM) (Supplemental Figure 1B). To assess possible effects of vitamin D on hepatic expression of Hamp in vivo, 12-week-old C57BL/6 male mice were placed on a vitamin D–deficient diet for 6 weeks and then transferred to a 4 ppm iron diet for 1 week. Groups of mice (n=4 in each case) were then treated with intraperitoneal injections of either 0.2 μg/g body weight 25D, 1 μg/g 25D, or 0.2 μg/g 1,25D. A similar volume of intraperitoneal saline was used as a control. Analysis of liver mRNA from these mice 24 hours after treatment showed no effect on expression of Hamp (Supplemental Figure 1C). In human cells, the suppression of HAMP expression by 1,25D or 25D appears to be due to direct inhibition of HAMP transcription. In silico analyses identified consensus vitamin D response elements (VDREs) within a 1071-bp HAMP proximal promoter DNA sequence (Supplemental Table 1). As shown in Figure 2A, chromatin immunoprecipitation (ChIP) assays using PBMC monocyte extracts demonstrated binding of vitamin D receptor (VDR) protein to DNA from a 1-kb fragment of the HAMP proximal promoter that includes the VDREs originally identified in Supplemental Table 1. Further ChIP analyses using extracts from the same cell type demonstrated similar VDR binding to promoter fragments for known VDR target genes such as CAMP and CYP24A1. Treatment of PBMCs with 1,25D enhanced VDR enrichment on the CYP24A1 and CAMP promoters (Figure 2A), consistent with the transcriptional induction of these genes by 1,25D (Figure 1, B and C). By contrast, VDR enrichment decreased 0.5-fold for the HAMP promoter after treatment with 1,25D. A similar differential promoter response to 1,25D was also observed for ChIP analysis of RNA polymerase II (RNA Pol II), which is essential for gene transcription. Further analysis of the effects of vitamin D on HAMP gene expression using a luciferase promoter-reporter construct transfected into VDR-expressing MC3T3 cells showed that treatment with 1,25D produced a 24% decrease in transcription relative to vehicle-treated cells (Figure 2B). However, in the absence of CYP27B1 expression/1α-hydroxylase activity in MC3T3 cells, treatment with 25D was without effect. VDR-mediated suppression of hepcidin (HAMP) gene expression by 1,25D. (A) ChIP analysis of VDR and RNA Pol II interaction with the HAMP gene promoter. PBMC monocytes are treated with 1,25D (5 nM, 24 hours), chromatin extracts are prepared, and ChIP-grade antibodies are used to detect VDR and RNA Pol II interactions. The resulting enriched genomic DNA is qPCR amplified using primers for CYP24A1 (−1 kb from the transcription start site and −2 kb from the transcription start site), CAMP (−1 kb from the transcription start site), HAMP (−1 kb from the transcription start site). A negative control sequence for VDR and RNA Pol II (IGX1A) is also used. Data are shown first as mean arbitrary units for PCR amplification of DNA associated with RNA Pol II or VDR in cells treated with vehicle or 1,25D (mean of two separate chromatin preparations). In addition, fold-change values are presented showing the change in RNA Pol II or VDR binding to DNA after treatment with 1,25D relative to vehicle-treated cells. (B) Effect of 25D (100 nM) and 1,25D (5 nM) on HAMP promoter-reporter activity in VDR-expressing MC3T3 mouse osteoblastic cells. Data are shown as HAMP target gene firefly/Renilla housekeeping luciferase activity (×10−3). *P<0.05, statistically different from vehicle-treated cells. In contrast to the suppression of HAMP in human monocytes or hepatocytes, 25D and 1,25D had no effect on levels of mRNA for ferroportin in PBMC monocytes, THP1 cells, or HepG2 cells (Figure 3A). However, Western blot and immunohistochemical analyses showed that treatment with 25D or 1,25D increased expression of ferroportin protein in hepatocytes and monocytes (Figure 3, B and C), suggesting a post-transcriptional mode of action for the effects of vitamin D metabolites on ferroportin. To assess the functional effect of vitamin D–mediated induction of ferroportin, further studies were carried out to determine expression of ferritin, an established marker of intracellular iron concentrations. Treatment with 25D or 1,25D decreased expression of mRNA for ferritin in PBMC monocytes, THP1 cells, and HepG2 cells (Figure 3D). Immunohistochemical analysis of ferritin protein in HepG2 cells confirmed that treatment with 25D or 1,25D also decreased expression of ferritin protein (Figure 3E). Effect of vitamin D metabolites on ferroportin and ferritin expression in human monocytes and hepatocytes. (A) Effect of in vitro treatment of PBMC monocytes (PBMCm), monocytic THP1 cells, and HepG2 hepatocytic cells with vehicle, 25D (100 nM) or 1,25D (5 nM) for 6 hours on ferroportin mRNA expression. Data are shown as mean fold-change in gene expression (±SD relative to vehicle [0.1% ethanol] controls). (B) Western blot analysis of protein for ferroportin protein in HepG2 cells treated with vehicle, 25D (100 nM), or 1,25D (5 nM) for 24 hours. Loading is normalized by analysis of the housekeeping protein β-actin. (C) Immunohistochemical analysis of ferroportin protein in PBMC monocytes after treatment with vehicle or 1,25D (5 nM) for 24 hours. Ferroportin protein is shown in red with 4′,6-diamidino-2-phenylindole (DAPI) staining of nuclei shown in blue. (D) Effect of in vitro treatment of PBMC monocytes, THP1 cells, and HepG2 cells with vehicle, 25D (100 nM), or 1,25D (5 nM) for 6 hours on ferritin mRNA expression. Data are shown as mean fold-change in gene expression (±SD relative to vehicle controls). (E) Immunohistochemical analysis of ferritin protein in HepG2 cells after treatment with vehicle, 25D (100 nM), or 1,25D (5 nM) for 24 hours. Ferritin protein is shown in red with DAPI staining of nuclei in blue. *P<0.05; **P<0.01; ***P<0.001, statistically different from vehicle-treated cells. For RT-PCR data, n=8 separate donors for PBMC monocytes, n=4 separate cultures of THP1 cells, and n=5 separate cultures of HepG2 cells. To assess the in vivo effect of vitamin D on hepcidin, a single-arm supplementation study was performed in seven healthy volunteers receiving a single oral dose of vitamin D2 (ergocalciferol, 100,000 IU). Analysis of serum samples before and after supplementation showed that circulating levels of 25D increased from 27.0±2 ng/ml (67.5±5 nM) before supplementation to 43.5±3 ng/ml (108.8±7.5 nM, P<0.001) after supplementation (Figure 4A). By contrast, supplementation with vitamin D had no effect on circulating levels of active 1,25D (Figure 4B). Analysis of circulating hepcidin levels by ELISA showed no significant variation in serum hepcidin between baseline samples. However, after vitamin D supplementation, circulating hepcidin levels decreased by 34% at 24 hours after supplementation (P<0.05) and 33% at 72 hours after supplementation (P<0.01) (Figure 4C). First, analysis of serum ferritin concentrations showed that baseline (−24 hours) data for all the healthy volunteers were within normal ranges (18–160 ng/ml for female volunteers and 18–2710 ng/ml for male volunteers). Second, supplementation with vitamin D resulted in a small (10%) but significant (P=0.04) decrease in serum ferritin after vitamin D supplementation (138.83±25.03 ng/ml at −24 hours versus 124.50±21.70 ng/ml at 72 hours). No statistically significant changes in serum iron concentration, iron binding capacity, or transferrin saturation were observed 72 hours after vitamin D supplementation. Effects of supplementation with vitamin D2 on circulating hepcidin levels in healthy humans. A single-arm pharmacokinetic study is performed in seven healthy volunteers (four men; median age 42 years; range, 27–63) to assess changes in serum levels of hepcidin after a single dose of oral vitamin D2 (100,000 IU). Two blood samples are drawn before supplementation and two are drawn after supplementation. Serum concentrations of 25D (ng/ml) (A), 1,25D (pg/ml) (B), and hepcidin (ng/ml) (C). Data are shown as the mean±SEM. Experimental means were compared statistically using a paired t test. *P<0.05; **P<0.01; ***P<0.001, statistically different from baseline values. In parallel with analysis of hepcidin and ferritin, assays were also carried out to assess circulating concentrations of hormones classically associated with vitamin D function. Fibroblast growth factor 23 (FGF23) and parathyroid hormone (PTH) concentrations were analyzed for six subjects at −24 hours and +72 hours after vitamin D supplementation. Data indicate that supplementation with vitamin D resulted in a significant increase in serum concentrations of FGF23 (62.57±6.70 RU/ml versus 74.71±9.88 RU/ml; P=0.03, two-tailed t test), and phosphate (3.27±0.67 mg/dl versus 3.61±0.33 mg/dl; P<0.001, two-tailed t test). Vitamin D supplementation resulted in a trend toward decreased serum PTH concentrations (58.86±6.43 pg/ml versus 51.29±7.47 pg/ml; P=0.06, two-tailed t test) but no significant change in serum calcium concentrations (9.19±0.12 mg/dl versus 9.07±0.2 mg/dl; P=0.36, two-tailed t test). Data presented in this study show for the first time that vitamin D is a potent regulator of the iron-regulatory protein hepcidin in both monocytes and hepatocytes. ChIP and promoter-reporter assays indicate that this occurs as a consequence of direct transcriptional suppression of the HAMP gene proximal promoter by 1,25D bound to its cognate nuclear receptor, VDR. This response contrasts the 1,25D-VDR–mediated induction of related antibacterial proteins such as cathelicidin and β-defensin-2.14 However, in a similar fashion to cathelicidin,15 1,25D-mediated regulation of hepcidin expression appears to occur directly, with liganded VDR binding to a specific VDRE within the HAMP gene promoter. Previous studies have shown that transcriptional regulation of CAMP by 1,25D-VDR is primate specific,15,16 indicating that antibacterial responses to vitamin D have evolved relatively recently. It was therefore interesting to note that suppression of HAMP by 25D or 1,25D was not observed in murine models, suggesting that vitamin D–mediated regulation of hepcidin may be part of the same evolutionary adaptations observed for other antibacterial proteins. In all three cell types studied, regulation of HAMP was observed after treatment with either active 1,25D or inactive 25D, suggesting an intracrine mode of action similar to that previously described for other antibacterial actions of vitamin D.13 Intracrine regulation of HAMP is endorsed by the fact that PBMC monocytes, THP1 cells, and HepG2 cells express mRNA for the enzyme that catalyzes conversion of 25D to 1,25D, 1α-hydroxylase/CYP27B1, as well as the VDR (data not shown). A similar mode of action has been reported for antibacterial effects of vitamin D in monocytes11,12 and antiviral responses to vitamin D in human hepatocytes.17 Intracrine responses to vitamin D appear to be exquisitely sensitive to the availability of substrate 25D,11,12,18 suggesting that the hepcidin-ferroportin homeostasis system may be influenced by serum vitamin D (25D) status (Figure 5). This hypothesis is supported by supplementation data from healthy volunteers showing that elevated serum concentrations of 25D (but not 1,25D) after a single oral dose of vitamin D2 produced a 34% decrease in serum hepcidin concentrations that persisted for 72 hours (Figure 4). Moreover, the regulation of serum hepcidin after vitamin D supplementation in vivo was at least as sensitive as more established markers of serum 25D status such as PTH, suggesting that hepcidin may be a useful marker of vitamin D function for future studies. Vitamin D and the hepcidin-ferroportin iron-regulatory axis. Schematic representation of a proposed mechanism for vitamin D regulation of hepcidin/HAMP – ferroportin (Fp) interaction in hepatocytes and monocytes. Under conditions of vitamin D deficiency, elevated synthesis of hepcidin by hepatocytes or monocytes may increase intracellular and systemic concentrations of hepcidin and decrease membrane expression of Fp in these cells. The resulting suppression of iron export will, in turn, lead to intracellular accumulation, increased cellular ferritin, and decreased systemic levels of iron. Under conditions of vitamin D sufficiency, decreased transcription of HAMP may lead to decreased intracellular and systemic concentrations of hepcidin and concomitant increased membrane expression of Fp. The resulting enhancement of iron export may then lead to decreased intracellular iron and ferritin and increased systemic levels of iron. Data for ferroportin and ferritin expression in vitamin D–treated monocytes and hepatocytes are consistent with the actions of hepcidin in promoting post-transcriptional suppression of ferroportin protein.19 On the basis of data presented in this study, we speculate that 25D and 1,25D can act to oppose this response and maintain membrane expression of ferroportin (Figure 5). Hepcidin-mediated loss of membrane ferroportin is known to be associated with intracellular retention of iron, leading in turn to iron-restrictive anemia.5 This has immediate implications for the control of systemic iron homeostasis but will also influence host defense during acute infections. Iron is essential for the survival and growth of almost all organisms, and an important strategy for mammalian antimicrobial defense is based on depriving pathogens of this essential nutrient.20 Thus, another facet of hepcidin physiology is its contribution to host innate immune function.3,21 By targeting ferroportin and decreasing extracellular iron, hepcidin appears to play a pivotal role in the so-called “hypoferremia” or “anemia” of infection, in which there is restriction of systemic iron to pathogens.5,22 Conversely, the resulting accumulation of intracellular iron will promote the growth of internalized pathogens such as Salmonella typhimurium,23 Mycobacterium tuberculosis,24–26 and Chlamydia psittaci,27 and innate immune and viral stimuli are known to stimulate the expression of hepcidin.25,28 In this setting, the effects of vitamin D in suppressing hepcidin and promoting ferroportin are consistent with its established intracellular antibacterial activity.13 We therefore hypothesize that regulation of the hepcidin-ferroportin axis is another key facet of vitamin D–mediated innate immune function, complementary to its reported effects on antibacterial proteins,11,13,29 and autophagy.30,31 In future studies, it will be interesting to determine the extent to which regulation of monocyte/macrophage iron homeostasis contributes to the generalized antimicrobial actions of vitamin D.
Hepcidin was originally identified as an antibacterial protein, but its potential as a clinical target stems primarily from its role in the anemia of inflammation. Unlike dietary iron restriction, anemia of inflammation involves intracellular retention of iron by monocytes and macrophages,32 and is thus intimately linked to aberrant hepcidin activity and associated dysregulation of membrane ferroportin function.33 Although this is a problem that is common to many chronic diseases,34 it is likely to be particularly important in patients with CKD where elevated hepcidin levels may be a crucial factor in the development of multiple pathologic complications associated with renal impairment.2 Consequently, targeting of hepcidin has been proposed as an alternative to supplementary iron and/or ESAs as therapy for the anemia associated with CKD.35 Potential strategies for suppression of hepcidin include direct effects of antibodies to hepcidin,36 hepcidin-binding oligoribonucleotides,37 and inhibitors of hepcidin expression,38 as well as indirect targeting via anti-inflammatory responses.39 However, we believe that this is the first demonstration of rapid direct suppression of hepcidin in humans. High-dose testosterone has also been shown to suppress hepcidin, but effects were only evident after 1 week of therapy.40 It was also interesting to note that the suppressive effect of vitamin D supplementation in vivo on serum hepcidin concentrations was accompanied by decreased levels of serum ferritin. The precise significance of this remains unclear but may reflect a generalized anti-inflammatory response to elevated serum levels of 25D. The effect of vitamin D on the hepcidin-ferroportin axis also suggests that low vitamin D status may be a contributing factor to the anemia of chronic disease. CKD is characterized by impaired vitamin D status, which is closely associated with adverse CKD health outcomes.41 In CKD patients, low serum levels of 25D correlate inversely with the prevalence of anemia7 and ESA resistance,8 and correlate directly with blood hemoglobin levels.8 Data presented in this study suggest that these observations are linked by the effects of vitamin D on the hepcidin-ferroportin axis. In hemodialysis patients with anemia, vitamin D repletion has been shown to correlate with lower ESA requirements.7,9 We therefore propose that by acting to suppress expression of hepcidin in hepatocytes and monocytes, simple vitamin D supplementation may provide a cost-effective and safe adjuvant therapy for managing the anemia associated with this disease. Human hepatocellular carcinoma HepG2 cells (American Type Culture Collection [ATCC], Manassas, VA) were cultured in DMEM with 10% FBS. Human THP1 monocytic cells (ATCC) were cultured in RPMI 1640 medium (Invitrogen, Carlsbad, CA) and 10% FBS. Mouse J774A macrophages (ATCC) were cultured in RPMI 1640 medium and 10% FBS. Ficoll-isolated PBMCs derived from anonymous healthy donors (screened in accordance with standard transfusion medicine protocols) were obtained from the Center for AIDS Research Virology Core/BSL3 Facility (supported by National Institutes of Health award AI-28697 and by the University of California Los Angeles [UCLA] AIDS Institute and the UCLA Council of Bioscience Resources). PBMC monocytes were isolated as previously described.42 PBMC monocytes were seeded in RPMI 1640 (Invitrogen) with 10% human AB serum (Omega Scientific, Tarzana, CA) and GM-CSF (10 IU/ml; PeproTech, Inc., Rocky Hill, NJ). MC3T3-E1 (MC3T3) murine osteoblastic cells (ATCC) were maintained in α-MEM plus 10% FBS before transfection with promoter-reporter constructs. MC3T3 cells were cultured to 50% confluence before transfection with luciferase firefly or Renilla constructs. For all cell types, in vitro treatments at 37°C and 5% CO2 included 25D (100 nM) and 1,25D (5 nM), with 0.1% ethanol as vehicle. A single-arm pharmacokinetic study was performed in seven healthy volunteers to examine the change in hepcidin serum levels, assessed by competitive ELISA (Intrinsic Life Sciences, La Jolla, CA) after a single dose of oral vitamin D2 (100,000 IU). For serum 25D, a rapid, direct RIA developed in the laboratory of Dr. Hollis and manufactured by Diasorin Corporation (Stillwater, MN) was used.44 An RIA manufactured by Diasorin Corporation was used to measure total circulating 1,25D concentrations.45 Circulating levels of PTH and FGF23 were measured with an RIA kit, a first-generation immunometric assay (normal range, 10–65 pg/ml; Immutopics, San Clemente, CA), and a second-generation C-terminal kit (Immutopics), respectively. Two samples were drawn before supplementation (so that each subject acted as its own control) and two samples were drawn after supplementation (24 and 72 hours). All biologic samples were obtained at 8 am after an overnight fast. This human study was approved by the UCLA Human Subjects Protection Committee, and consent was obtained from all subjects. Adherent cell cultures or centrifuged pellets of PBMC monocytes, THP1 cells, or HepG2 cells were initially lysed with 1 ml RNAzol. Each sample was then transferred to Eppendorf tubes and RNA was extracted by adding 0.2 ml chloroform in a fume cabinet, and then vortexing samples for >5 seconds followed by centrifugation at 12,000×g for 15 minutes at 4°C. The aqueous phase was collected for each sample and mixed with 1 μl glycogen and 0.5 ml isopropanol. Samples were then vortexed and centrifuged again as described above. All fluid was then discarded and the resulting RNA pellet dried in the Eppendorf tube. The resulting pellet was then washed with 1 ml 70% ethanol and vortexed and centrifuged again, followed by further air drying of the resulting pellet. Finally, RNA pellets were resuspended in ≥14 μl of RNase free water and stored at −20°C after RNA quantification and quality assessment (260/280 ratio; Nanodrop). Aliquots (300 ng) of resuspended RNA were reverse-transcribed using the SuperScript III RT enzyme as recommended by the manufacturer (Invitrogen) and as previously described.12 Quantitative real-time RT-PCR was performed in a Stratagene cycler (La Jolla, CA), using TaqMan probes and primers (Applied Biosystems, Foster City, CA).12,46 Expression of mRNA for the VDR (VDR) (Hs001721113_m1), the vitamin D–activating enzyme 1α-hydroxylase (CYP27B1) (Hs00168017_m1), the vitamin D catabolic enzyme 24-hydroxylase (CYP24A1) (Hs00167999_m1), HAMP (Hs00221783_m1), ferritin (Hs00830226_gH), ferroportin (Hs00205888_m1), CAMP (Hs00189038_m1), and mouse hepcidin (Hamp) (Mm00842044_g1) was quantified using TaqMan human gene expression assays, as previously described.12 All reactions were amplified under the following conditions: 95°C for 10 minutes followed by 40 cycles of 95°C for 30 seconds, 55°C for 1 minute, and 72°C for 1 minute. Data were obtained as ΔCt values (the difference between Ct of the target gene and Ct of the housekeeping 18S rRNA gene). For visual representation, ΔCt data for each treatment were converted to fold-change relative to ΔCt for control vehicle-treated cells (ΔΔCt) using the equation 2−ΔΔCt. Expression of ferroportin protein was assessed by Western blot analyses using previously reported protocols,46 involving overnight incubation with primary ferroportin antibody (1/1000; Amgen, Thousand Oaks, CA). A β-actin antibody (Sigma-Aldrich, St. Louis, MO) was used as a loading control. Immunofluorescence analysis of ferroportin and ferritin was carried out using adaptations of previously described methods.46 Briefly, monocytes or hepatocytes were seeded on 4-well glass slides, and incubated for 1 hour with antibodies to ferroportin (1/200; Amgen) or ferritin (1/200; Abcam). Secondary antibodies labeled with Alexa 594 were applied for 1 hour, and finalized with 4′,6-diamidino-2-phenylindole (1/10,000, 5 minutes). To predict potential HAMP promoter chromatin binding sites for the VDR protein, the NubiScan program (www.nubiscan.unibas.ch) was used. A −1071-bp HAMP gene promoter sequence was analyzed using the general weighted matrix for nuclear receptor half-sites (including the VDR canonical half-sites), enabling direct-repeat 3 sites characteristic of VDR to be acquisitioned. For the search parameter, an automatic scan with a raw score threshold of 0.5 was used, where the optimal match would have a raw score of 1. To assess physical binding of the VDR and associated transcriptional machinery to the HAMP gene promoter, ChIP was carried out. PBMC monocytes were treated with 1,25D (5 nM, 24 hours) and chromatin extracts prepared as previously described.47 ChIP-qPCR assays were performed using the ChIP-IT Express kit (Active Motif) and the ChampionChIP kit (SABiosciences, Inc., Valencia, CA). ChIP-grade antibodies were used to detect VDR (sc-13133) and RNA polymerase II (SABiosciences, Inc.) interactions. The resulting enriched genomic DNA was purified (QIAquick kit; Qiagen, Inc., Valencia, CA) and measured by qPCR using the EpiTect ChIP-qPCR Primer Assay for CYP24A1 (GPH021775(−)01A (−1 kb from the transcription start site) and GPH021775(−)02A (−2 kb from the transcription start site), for CAMP (NM_004345.3, −1 kb: GPH1009280(−)01A), for HAMP (NM_021175.2, −1 kb: GPH1006776(−)01A), and for the negative control sequence IGX1A (all Qiagen). The qPCR program was 10 minutes at 95°C, followed by 15 seconds at 95°C and 1 minute at 60°C for 40 cycles. A dissociation curve analysis was run to monitor the specificity of amplification and lack of primer dimers. Data were shown first as arbitrary units for qPCR amplification of DNA associated with RNA Pol II or VDR in cells treated with vehicle or 1,25D. In addition, fold-change values were calculated to show the change in RNA Pol II or VDR binding to DNA after treatment with 1,25D. A pGL4.17 firefly luciferase reporter vector containing the entire proximal promoter (2997 bp) DNA sequence was used for analysis of 1,25D/25D-regulated HAMP transcription using previously reported protocols.48 All transient transfections were performed using Lipofectamine 2000 Reagent (Invitrogen) at a ratio of 1:1 (total DNA to lipofectamine) according to the manufacturer’s recommendations. Briefly, cells were seeded into 96-well plates at a density of 2×104cells per well 24 hours before transfection. Each transfection was performed using 200 ng HAMP construct cotransfected with 50 ng Renilla luciferase plasmid to normalize transfection efficiency. Transfection recipient MC3T3 cells, which express VDR but do not express CYP27B1, were treated with vehicle (<0.2% ethanol), 25D (100 nM), or 1,25D (10 nM) 24 hours before harvest with 30 µl Passive Lysis Buffer (Promega, Fitchburg, WI). Luciferase activity in cell lysates was assessed using the Dual Luciferase assay kit (Promega) according to the manufacturer’s protocol and measured using a FLUOstar Omega instrument (BMG Labtech, Cary, NC). Specifically, 20 µl of each sample was transferred into a white 96-well plate. The FLUOstar was programmed to inject 90 µl Luciferase Assay Reagent II followed by 90 µl Stop & Glo. Transcriptional activity was expressed as luciferase activity relative to Renilla activity. Each treatment was performed in triplicate and repeated on at least three separate occasions. Results were expressed as fold-change over untreated cells by dividing the firefly/Renilla ratio of treated cells by the firefly/Renilla ratio of untreated cells. RT-PCR data for in vitro and ex vivo studies were compared statistically using an unpaired t test. Where indicated, multifactorial data involving 25D/1,25D treatments were compared using one-way ANOVA with the Holm–Sidak method used as a post hoc multiple comparison procedure. Statistical analyses were carried out using raw ΔCt values and fold-changes. Spearman correlation test was used for bivariate analyses. For the vitamin D supplementation in healthy volunteers study, clinical data are presented as the mean±SD for variables with normal distributions, or median (range) for variables with skewed distribution. A paired t test was used to compare baseline samples, and baseline 1 with post-treatment samples. All statistical tests were performed at the two-sided 0.05 level of significance. Analyses were performed using the SPSS software (version 19.0; SPSS, Inc., Chicago, IL) for Windows. M.W. is a stockholder and executive officer of Intrinsic LifeSciences and has received honoraria from Janssen Research and Development. In addition, M.W. is a developer of the hepcidin assay used herein and holds United States patents involving hepcidin C-ELISA compositions and methods. The authors thank Drs. Thomas Ganz and Ella Nemeth (both UCLA) for kindly providing reagents and technical assistance with this manuscript. They also thank Mrs. Barbara Gales for her help in facilitating the supplementation study. This work was supported in part by educational grants from the Académie Française/Jean Walter Zellidja, Réunion Pédiatrique de la Région Rhône Alpes, Société Française de Pédiatrie/Evian, Fondation pour la Recherche Médicale, and the Philippe Foundation (to J.B.), as well as grants from the US National Institutes of Health (DK0911672 to M.H. ), US Public Health Service (DK 67563 and DK 35423 to I.B.S. ), Casey Lee Ball Foundation (to I.B.S. ), and National Institutes of Health/National Center for Research Resources/National Center for Advancing Translational Sciences University of California Los Angeles Center for Translational Science Institute (KL2TR000122 to J.J.Z. and UL1 RR-033176 and UL1TR000124 to I.B.S.). The content is solely the responsibility of the authors and does not necessarily represent the official views of the National Institutes of Health. This article contains supplemental material online at http://jasn.asnjournals.org/lookup/suppl/doi:10.1681/ASN.2013040355/-/DCSupplemental.